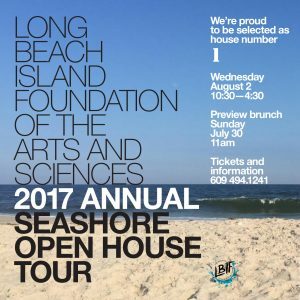 Aitken Builders Selected as House #1 by the LBIF on the 2017 Seashore Open House Tour - A. Richard Aitken, Jr.
We are thrilled to announce we have been selected by The Long Beach Island Foundation of the Arts and Sciences (LBIF) as house Number #1 on the 2017 Seashore Open House Tour. If you are considering a new home or renovation project on LBI, or simply share our love for art and architecture, this is an event you will not want to miss! This must-do event will take place Wednesday, August 2, from 10:20 a.m. to 4:30 p.m.
You can call 609-494-1241 for additional information and tickets.